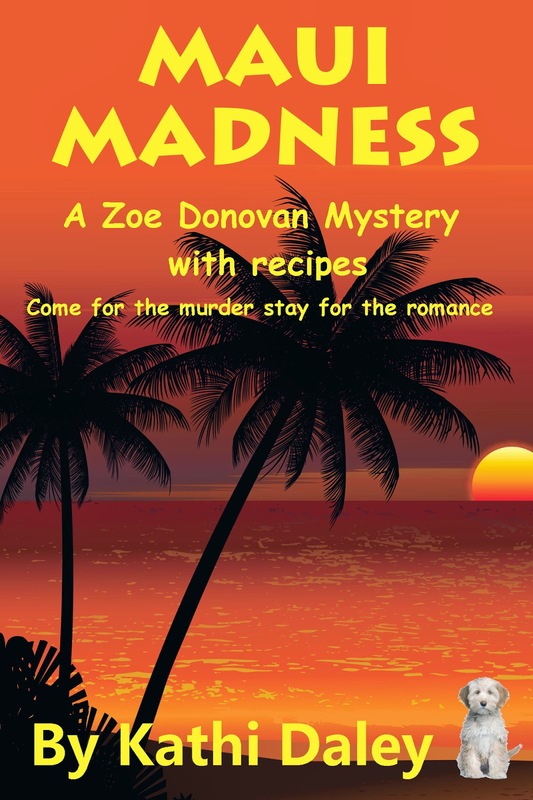 Zoe and the gang go to Maui and become involved not only in a treasure hunt for a sunken ship, but in a murder mystery with more twists than a mountain road. Join the gang as they dine in popular restaurants, go shopping, try surfing, and make new friends only to have to decide who they can trust and who may be hiding more than they are sharing. There are some things you should never do. Not even if you are on vacation and you adhere to the adage what happens in Maui stays in Maui. Not even if you’re able to make your boyfriend laugh and your best friends smile for the first time in weeks. Not even if you’re sipping your third Mai Tai in less than two hours and any inhibitions you may have at one point possessed have gone the way of your common sense. Unfortunately, I didn’t stumble across this very important piece of insight until it was too late. Much, much too late. “They’re almost ready for you,” the woman who poured me into a bikini at least a size too small assured me. “Are you sure you don’t have a larger bikini top?” I desperately tried one last time. “Don’t worry; you look great,” the gaudily clad woman dressed in leopard-print tights and a tube top assured me. “To be honest, at this point I’m much less concerned about looking great than I am about one or both of the girls making a guest appearance before the end of the show.” I looked down at my breasts, which looked ready to explode from the top, which must have been designed to fit a prepubescent twelve-year-old. I glanced out at the audience, who were being entertained by the antics of our host, Hula Bob (yes, he actually calls himself that). I figured the effects of the Mai Tai must be wearing off because it suddenly occurred to me how absurd the series of events leading up to this moment really were. It all started a mere five days ago. My boyfriend, Zak Zimmerman, and my best friends, Ellie Davis and Levi Denton, had all suffered painful losses, so we’d decided—quite spontaneously, I might add—to fly to Hawaii for the two weeks Ellie was supposed to be on her Hawaiian honeymoon. It made perfect sense at the time. The beach house Zak had borrowed for Ellie’s honeymoon was already reserved; Ellie had arranged to take the time off from work; Levi, a teacher, was off for the summer; and I had wonderful assistants to cover for me at the animal rescue and rehabilitation shelter I run. Zak, of course, is stinking rich and works when he wants to. With barely a thought, we’d packed our bags and flown across the ocean on the private jet Zak had chartered so that my dog Charlie could come along. The thing is, as spontaneous and fun as I found the adventure, Zak, Levi, and Ellie barely said a word on the flight over or the limo ride to the house. I had felt bad for my friends and wanted so desperately for them to have a wonderful time that when I saw the flyer announcing tonight’s comedy show, I’d begged, prodded, bribed, and pleaded until the gang agreed to go. “Two minutes,” the woman whispered as I fought the urge to flee. The show really had been funny to this point, and we’d arrived early, so we had perfect seats right in the front. Hula Bob had a tendency to find the absurd in everyday life that most of the audience found quite comical. I could see that my friends were beginning to relax and have fun for the first time in weeks, and I guess I got caught up in the festive atmosphere. Still, I’m not sure that explains the brief moment of insanity that caused me to jump onto my feet and raise both hands high into the air when Hula Bob asked for a volunteer from the audience. “Ready?” The woman with the leopard-print tights took my hand and led me onto the stage. Everyone clapped and quite a few of the men whistled as I was led onto the stage in nothing but the very small bikini. I tried to smile and look at the audience but couldn’t help but glance down at Thelma and Louise to verify that they were staying put. As I walked onto the stage in my bare feet, I saw that there were three other women dressed pretty much the same as me. They looked happy and relaxed. Perhaps they knew something I didn’t. I wanted to say no, but then I glanced at Zak, who had a huge smile on his face. God, I love that smile. I’ve missed it so much in the weeks since Lambda had his fall. “You bet I’m a good sport.” I turned on my brightest smile. Zak and Levi both let out a whoop-whoop. The men had wanted to participate in the dive event, but the slots were limited and had been sold out for months. Sounded straightforward. None of the other women looked to be in as good shape as I am, so I figured I had this locked in. I supposed that explained the swimsuit. I was both a scuba diver and a free diver and had been on the dive team in high school, so I figured that whichever type of dive Hula Bob was referring to, I had this event in the bag. I was feeling self-confident to the point of smugness when the stagehands rolled out four Dumpsters filled with garbage. “We’re diving in those?” I groaned. “Do you see a pool?” Hula Bob asked, his white teeth shining like a beacon in contrast to his deeply tanned face. Hula Bob handed us each a piece of paper. On the list were five items. Bob explained that each Dumpster contained the five items and our task was to hop on in and start digging until we found all five. I was about to refuse until I noticed that the other three women trotted over to their Dumpsters and began stretching like they were preparing for an Olympic event. If they can do it, I can do it, I decided. “I’ll count down from three. When I say go, you can hop on in,” Bob instructed. I quickly looked at my list. Item number one was a diaper. Ew. I really, really hoped it was an unused diaper. I had a new baby sister and had certainly changed my share of used diapers as of late, but I really didn’t want to land on one when I was launched into the Dumpster by the nice man who was assigned to give me a boost. I’m not sure what exactly happened upon my entry to the Dumpster, but somehow I got turned around and ended up falling headfirst into the mess. I didn’t even want to think about the squishy thing my head hit until I realized it was spaghetti, item number three. Awesome. Only four items to go. I managed to be the second person to climb out of her Dumpster with all five items. Sure, I had spaghetti in my hair and something green and disturbingly gooey on my left thigh, but I also had two points. I wasn’t sure what the next two events would entail, but I was determined to win this thing or die trying. “Can I get a round of applause for all four women?” Bob shouted into the microphone. Everyone hooted and shouted out the name of their favorite contestant. I could tell that I was by far the fan favorite. I raised my hands in victory and danced around in such a way as to make Rocky proud. I was actually having a really good time until I heard the details of challenge number two.